The white spots are pretty much the same as on my snake. The white spots were not there as a hatchling and only started showing up with the last few sheds. And they are getting bigger with each shed. 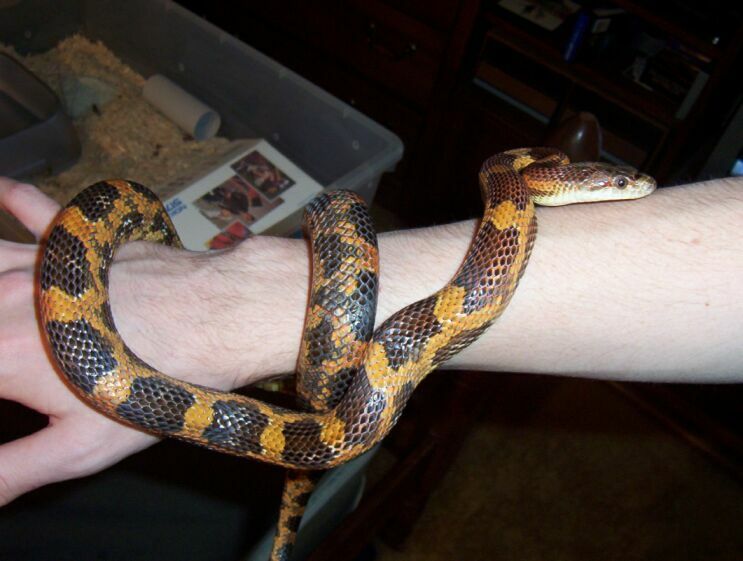 However, this is a natural occuring coloration in my snake,as I caught him in Bullitt county KY as a hatchling. Very interesting, I guess I will just have to wait and see if they continue to get larger as the snake grows. And once I find a suitable mate, I would like to find out if this can be passed on to his offspring. Just curious, how big is your texas rat? Very nice looking. Love those colors!! He looks pretty comparitve in size to my black rat. Mine was 40" last time I measured him, and I am certain he is probably pushing 42 or 43". Growing like a pig! :Here is a pic of my 01' Orange Tx Rat from Dwight Good as well that shows off the same white spot action that is on your Blk Rat. Pretty interesting if you ask me, if even a coinsidence being from the same breeder. They have been growing larger (relative to the snake) with time. I don't beleive they existed before the snake was a yearling.